During the three days of the Fair, the latest collections were presented by nearly 450 companies and brands from 16 countries. The largest group of visitors – apart from the traders from Poland – was that of the entrepreneurs from such countries as: Kazakhstan, the Netherlands, Denmark, Italy, Russia, Ukraine, the United States, Turkey and the Czech Republic. - The YOUNG FASHION FOR SALE project is a result of our efforts aimed at enhancing the market position of young and highly creative designers. The collections of the project participants were warmly welcomed by the public, so we hope that their participation in the Poznań Fashion Fair will bring them a number of benefits. We are pleased with the results and we have already started working on the next edition of YOUNG FASHION FOR SALE, which will be enriched with solutions proposed by young designers - says Edyta Bonin-Kanikowska, the Director of the Poznań Fashion Fair. On the first day of the Fair, the Polish Fashion Gala took place, during which Silver and Gold Loop awards, as well as the TOP MODA mark, were awarded. During the event, the nine finalists of the nationwide Silver Loop competition presented their own collections on the catwalk. The award went to the hands of Weronika Jaworska, a student of garment industry school in Poznań. The collection by Weronika Jaworska entitled "and lead us not into temptation" is inspired by the history of Adam and Eve. The cuts and collection materials allude to the scene of Eve's temptation by the serpent. Polish Academy of Fashion, for the very first time, gave the Gold Loop awards not to designers and manufacturers, but to those who contributed to the development of Polish fashion industry. The Gold Loop was awarded to: Rafał Bauer, the President of Próchnik S.A., and Joanna Przetakiewicz, the founder of the La Mania brand. The jury also awarded the TOP MODA 2013 - TOP BRAND and the GOOD QUALITY AND FASHIONABLE DESIGN MARK. The winners of the TOP BRAND COMPETITION were the following companies: Salony Urody BEVERLY, Salony Fryzur i Stylizacji A. Chołota, Nissan Polody, Paper+Design, STRIMA Sp. z o.o. The GOOD QUALITY AND FASHIONABLE DESIGN MARK award was given to Aleksander Gliwiński, Elizabeth Passion, SHARK Błaszczyk-Szejko sp.j., Przedsiębiorstwo Handlowe CYBINA, Próchnik S.A. and PPH SEMPER. During the gala event, the latest collections of the Próchnik, CYBINA, SEMPER and SHARK brands were presented on the catwalk. Dominika Jagiełło for "One's Laptop Cases" notebook bags collection - the Main Prize of Modeus 2013. Monika Krauszowska-Bigos for the "Rubberbag" collection - Traders, Buyers and Bloggers' Awards. Martyna Sztupecka for the "NEW ART-POP" bags collection - Manufacturers' Award. And finally the websites Butyk.pl, Deezee.pl and Loft37.pl were awarded the Fashion Website. Awards, as the most professional websites in the fashion industry. 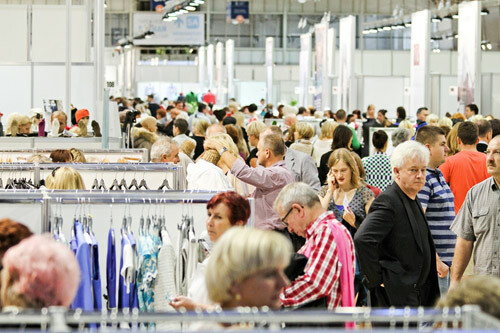 The next edition of the Poznań Fashion Fair will be held on February 26-28, 2014.